How surge pricing became the restaurant world’s scariest — and possibly smartest — new idea. Restaurant owners are always happy to gripe about the rising costs, labor issues, and various bureaucratic headaches that make their industry so difficult. But lately, it seems like they might actually have a point: New York, for example, kicked off 2019 with a mandatory wage hike. At Amy’s Bread, 210 employees got a New Year’s pay raise, and as a result, costs for the company will increase by $500,000. (Workers should be paid fairly, of course, and raises are inarguably good, especially in an industry with a history of labor exploitation, but someone still has to pay for it.) Top this with costly ingredient shortages, utilities to cover, and of course rent, which, in New York, has jumped from equaling an average of 5 percent of overall sales to almost 10 percent. To cope, operators have winnowed staffs, cross-trained workers as jills- and jacks-of-all-trades, simplified menus, and even begged City Hall to let them put a surcharge on checks. Meanwhile, a new report released by the Labor Department finds that menu prices nationwide increased by 0.5 percent last month, the biggest leap since 2011. But what if a potential solution has been lying around for years, yet is so against the institutional grain of restaurateur-ship that few in the industry are willing to give it a chance? Dynamic pricing remains a largely untapped tool within the industry, but its proponents say it’s an effective way to combat spiraling costs — without actually raising menu prices. Restaurant owners hate higher prices as much as diners do. In a new survey on restaurants’ business strategies for 2019, 87 percent of respondents told the NYC Hospitality Alliance — a trade group dedicated to “the growth and vitality” of the industry — that they will raise menu prices to offset labor costs. That figure sounds high, until you realize that 90 percent of owners said they would raise prices in 2018. Instead, it sounds like owners are increasingly looking to even more drastic solutions to help lower costs: 47 percent of the survey respondents said they would eliminate jobs in 2019 (compared to 36 percent in 2018), and a full 61 percent said they’d rethink their food and drink entirely (compared to 56 percent last year). “Restaurants have really started looking at every single aspect of operations,” says NYC Hospitality Alliance executive director Andrew Rigie. But would they really embrace supply-and-demand pricing? “There’s a huge desire to drive traffic during off-peak hours,” he says. “Restaurants have always given deals to get people in seats at less popular times.” Rigie thinks that it’s a “win-win” if prices are lower when demand drops, especially at restaurants where diners book in advance, because it helps margins, curbs waste, ensures tips during lulls, and can even feel more democratic for diners: “It’s a pleasant surprise,” he explains, “if a burger that’s usually $20 suddenly costs $15” because demand has dropped. The comparison to airplanes has been made before, but it bears repeating: Even though a restaurant’s costs (food, labor, insurance, rent) are fixed, it’s almost always preferable to have a customer in a seat, even if they’re paying a discounted rate, than to let that seat sit empty and sell nothing at all. The object of dynamic pricing is not to jack up the cost of dinner. ﻿One big misunderstanding is that proponents of dynamic pricing want to quietly implement a pay-to-play strategy. (Alessandro Borgognone, owner of Sushi Nazakawa, has argued that paying more to get Friday or Saturday night reservation is no different from “palming a hundred dollars to the maître d’” — which isn’t exactly a good look.) The phrase “surge pricing,” meanwhile, conjures images of $415 Uber rides in the snow, and once that happens, it’s pretty much over for restaurants. In fact, past examples demonstrate that up-charging for prime-time experiences is simply bad for business. 1. Resy’s first business model was built around users paying premiums for tables at popular restaurants. That concept flopped. Resy’s reservations are now free, and most copycat apps (Table8, Shout, Zurvu) have gone belly-up. However, a different route was pursued by Bob Bob Ricard, a tony London restaurant where a Waldorf salad costs $32 and booths are famously outfitted with champagne buttons. The owners needed lunchtime diners, not more hype: On a Saturday night, the restaurant could fly through 400 covers and still have a waitlist. But only 40 people might show up for lunch on any given weekday. So, in early 2018, the restaurant started charging less during “off-peak” and “mid-peak” times. Now, the restaurant’s lunch prices are, “on average, 20 percent below the dinner menu,” so, for example, lobster mac and cheese costs the equivalent of about $31.50 instead of $38. Owner Leonid Shutov says the discount has doubled the crowd during their slowest hours, and he claims diners don’t really spend less, either. 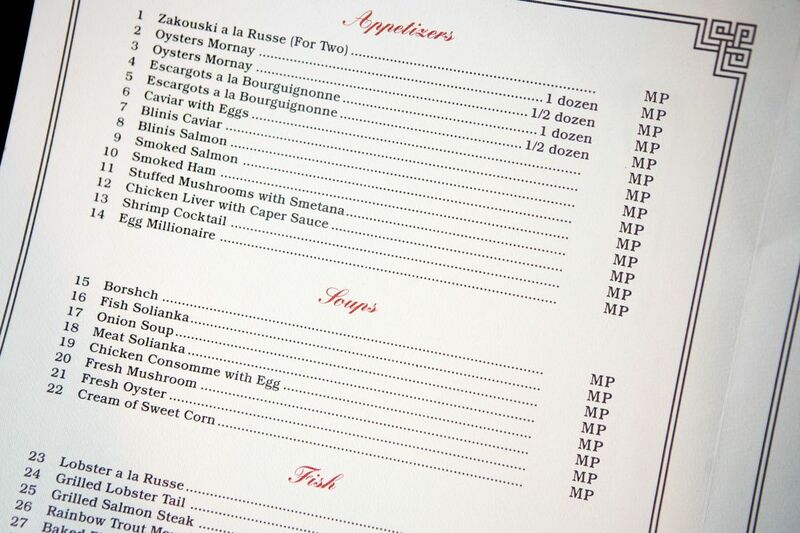 “Our average checks have not changed in any meaningful way,” he told NPR last year, adding that the guests getting the deal instead chose to “reward themselves” with more caviar or champagne. Charging $100 less on a Tuesday night, or when the wind chill is 22 degrees below, might seem counterintuitive, but Kokonas claims this idea has helped his company triple its margins in recent years. One of his favorite examples involves Super Bowl Sunday, traditionally the slowest day of the year at any restaurant not named Buffalo Wild Wings. In 2014, Kokonas tried a test: The previous year, they’d had 28 diners, total. “As of noon, it still looked like a losing day for us,” he says. The kitchen had 30 bored cooks, and the front-of-house was listlessly doing side work, costing Alinea the same as any other workday. Around 12 p.m., Kokonas says he tweeted, “Don’t care about football tonight? Come eat at Alinea instead.” They repriced tickets — $165, or 35 percent off — and wound up doing 74 covers that night, worth $23,800 in sales and service. He says that turned into Alinea’s best first fiscal quarter ever. January had historically been break-even at best, but since moving to variable pricing, Alinea has run 12 to 15 percent above the bottom line for the first three months of every year. New technology makes it simple for restaurant owners to implement dynamic pricing. Haute cuisine isn’t the only part of the industry where it makes sense to incentivize eating at off-hours. A phalanx of apps have cropped up to try and convince consumers to grab food on slower days or at less popular times of the day. Gebni (a delivery app “with smart prices to save you money”), Taste Bud (slogan: “Eat. Save. Get Paid”), and Feedback (“Smart pricing with a purpose”) are three examples. Gebni was co-founded by Mohamed Merzouk, who says he ordered meals at illogical times of day while studying for his MBA and disliked paying the same price as customers who ate during normal mealtimes (a.k.a. when restaurants least needed any new business). So he and his business partner created Gebni, a “stock market of restaurants,” where the cost of a burrito might fluctuate from $12 at noon to $8.50 by 3 p.m., depending on demand. “This industry is cutthroat. Profit just gets competed away,” Merzouk explains. “Why not adjust prices for the six hours every day when you make very little revenue but still have expenses?” Now, nearly half of the app’s sales, 46 percent, occur during off-peak hours, a figure that’s closer to 10 percent on traditional delivery apps like Grubhub. PriaVanda Chouhan, chef-owner of the popular Indian spot Desi Galli, thought her menu of kathi rolls and tikka masala poutine (which recently impressed Vogue) wasn’t being marketed well enough as snacks. So, using Gebni, she dropped afternoon prices by 15 to 20 percent. “You can play with which items are discounted,” Chouhan says, noting she can target a day’s slowest-moving ingredients, and if items suddenly become popular, the algorithm bumps up the price so that Desi Galli pockets more money per sale. The profits help pay newer staff who, prior to 2019’s $15 minimum wage, were making $13.50 an hour (the industry’s median hourly pay for non-tipped workers is less than $9), and her kitchen is now down to around one percent food waste. But can this really take off? Food & Wine recently asked its readers, in regard to surge pricing at restaurants, “Should you be scared?” Rigie, the NYC Hospitality Alliance head, warns that for any change, whether that’s tweaking menu prices or eliminating tipping, not only do you have to train staff, but customers have to adjust as well. Both must occur simultaneously, too, making it an intimidating thing for restaurant owners to dive into. But that doesn’t mean it’s impossible. This recalls the industry’s fears over another far-out idea for making more money: charging for bread. In the late aughts, when the once-free perk suddenly landed on menus with something like a $7 price tag, the refrain was that American diners would object on principle alone. It was antithetical to the traditional restaurant-going experience, even though, on balance, it made sense. It’s not like bread and butter are free for restaurant owners — why should they be forced to give them away? Still, to justify the decision, chefs who slapped a price tag on theirs were forced to make it extra good, and the bread served in restaurants today is better as a result. Can ‘Surge Pricing’ Really Take Off at Restaurants?